A trio of grave robbers blast their way into a cursed mummy tomb. Their discovery of the riches within are interrupted by a band of American fashion models who have arrived to do a photo shoot. The intense lights used by the photographers revive the mummy and his army of flesh-eating ghouls. The monsters hunt down people one-by-one, before spilling out into the streets of a near-by town to munch on the locals. Dawn of the Mummy is the polar opposite of The Awakening (1980). The Awakening attempts (and fails) to evoke ponderous horror and dread, Dawn is a goofball gorefest that is much more invested in grossing out the audience than having an actual plot. I would say it is as equally as terrible as The Awakening, but it is much more entertaining in the process. Outside of the Egyptian trappings, this movie has more in common with other Italian zombie movies of the time, nonsensical dialogue, long loving shots of intestines being eaten, and a delightfully funky soundtrack. The grave robbers are amusingly loony to watch, but nearly every scene where the fashion models aren’t being chased and eaten is agony to sit through. The mummy and ancient Egyptian elements are wholly unnecessary to the story, but they do keep the movie from being just another zombie movie. 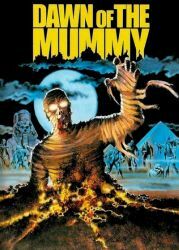 It might not have its sights set on being anything grand, but Dawn of the Mummy succeeds in what it aims to accomplish.